Whether you are travelling for work or play, Tsogo Sun has a hotel for you. With a host of brands across the country, each ideally located in key destinations, you’ll be spoilt for choice. 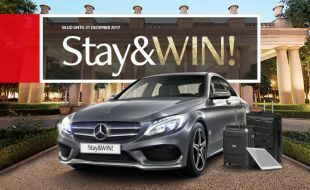 Stay with us any time between 1 September and 31 December 2017 and you will stand a chance to win your share of prizes worth over R700,000, including the Mercedes-Benz C-Class Edition C with AMG Line, iPads, weekend holidays, Takealot vouchers and luggage. Remember that for every R500 you spend when you stay with us, you’ll get 1 entry into the draw. Rewards members can also earn SunRands which they can put towards their next stay. The more you stay, the greater your chances of winning. It’s simple, choose Tsogo Sun, Stay&Win. The winners for our first monthly draw have been selected! Once they’ve been notified, we will publish their details here. If you weren’t successful, don’t worry, there is still a chance for you to win in our next monthly draw is taking place on 12 January 2018 at 12h00. Entries cannot be purchased for cash, SunRands or through any other form of promotional consideration. In the event that an employee of a company is selected as a winner, where the company has paid for the employee’s accommodation or extras, Tsogo Sun shall not be held liable nor shall Tsogo Sun entertain any dispute that arises between the employee and the company.